The A2 Curved Borders One can help you to create a different shape to your cards... and is another of the borders dies from Spellbinders. 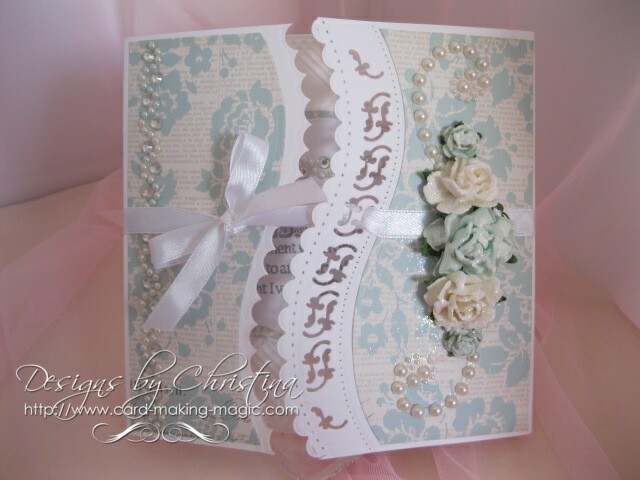 This Gate Fold card has been created with the help of the curved borders die set and the result is quite striking. There are six dies to the set ... four cutting edges and two that will create the pattern in the curve. There are other tutorials for you using the other Borders from Spellbinders that you may like to view but which ever one you have in your personal collection they all work basically the same way. So why not make yourself a nice cuppa and then sit back and relax as you watch the short tutorial on how to get the most from these dies and then get busy with your prettiest papers and all the "Bling" you like to add and try it for your self. I am sure that you won't be disappointed with the results. Any verse or sentiment that you would like to add can be fitted onto the inside of this style card using a shaped label or tag. 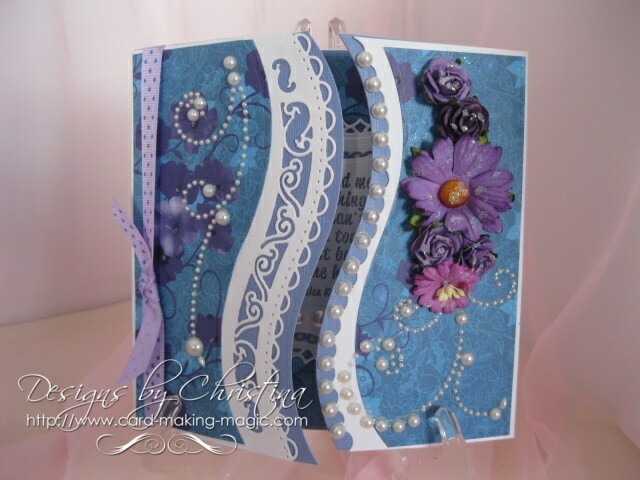 The self adhesive pearl flourishes that I have used on both of these cards is from Want2Scrap and just adds that extra luxury touch for any of my designs. Don't be afraid to cut these pearl flourishes into smaller pieces and so making them go a lot further ... and keeping the cost down. Add your ribbons in a different way for even more effect and of course flowers are always welcome on your "Girly" cards. On the card in the video the ribbon has been used to hold the gate fold closed ... but if you don't want that look then just miss out that step.